For our 5 Minute Microwave Version, CLICK HERE. So a few weeks back we posted our Salsa Recipe, a spicy little number we’ve been mixing up for years. Hopefully you’ve gotten a chance to whip up a batch of Salsa as well, and, unless you’re down with guzzling it solo, you’re now most likely looking for something to pair it up with. 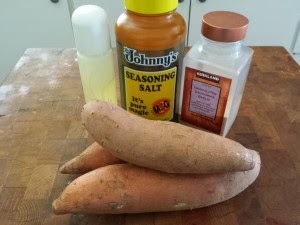 Look no further, because in this post we’re gonna go over the steps in order to cook up our Sweet Potato Chips. They’re one of our favorite recipes and also a healthy addition to your B.U.F.F. (Better Understanding of Food & Fitness) arsenal! 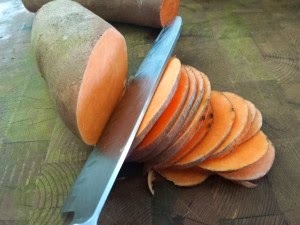 After you’ve scrubbed the potatoes, carefully slice them as thin as you can. (We leave the skin on) If you know you are going to make these often. 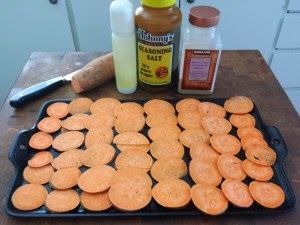 You might invest in a Mandolin/potato slicer. Spray your cooking sheet very lightly. 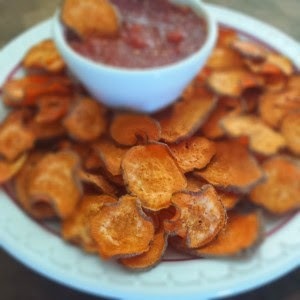 Lay the chips out over lapping slightly. Sprinkle the garlic powder and seasoned salt. Put into your preheated 250 degree oven. Pull the sheets out and flip your chips over. Return them to the oven for additional 30 minutes. Check your chips. The thinner sliced ones will bake quicker. If they start turning brown, pull those out. Tip: You may need to leave the thicker sliced for another 15 minutes. Let them completely cool. 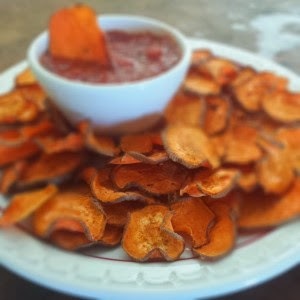 Now enjoy these crispy Sweet Potato chips with your homemade salsa!